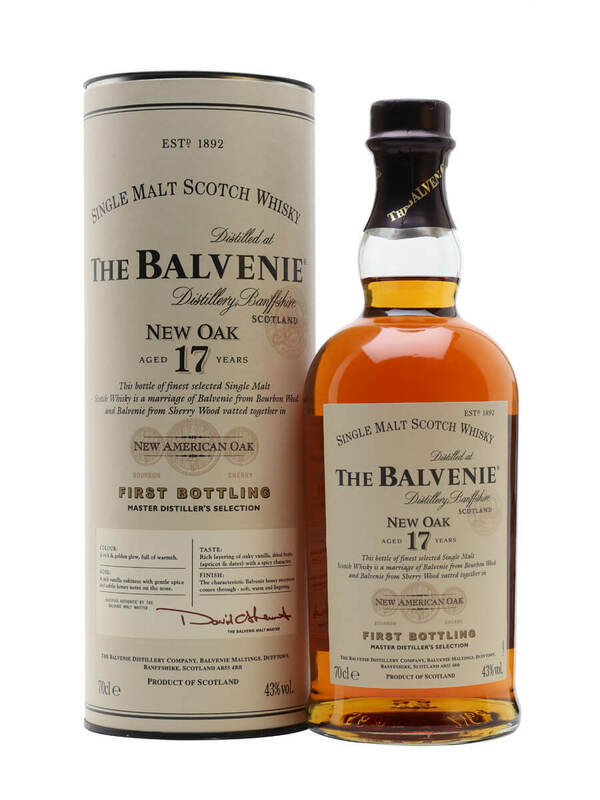 Balvenie New Oak 17 "First Bottling"
Now don't get confused, even if the folks at Balvenie appear to be trying to confuse you. Yes, there was a "limited release" Balvenie New Wood back in mid-2006. This Balvenie New Oak is not the same. And although it apparently replaces the "Limited Release", it is called "First Bottling". And you will also note the abv is 43% rather than 40%. Beyond that I suppose it is completely different. Right? Retailers' websites don't seem to help the matter much where "New Wood" and "New Oak" seem to be used interchangeably. Gets worse: the Balvenie official website (U.S. one, too)doesn't even make mention of this product, "New Wood", "New Oak", or "Who Knew?" So I'll just drink it. Besides, it's what's inside that counts. For distillery info and to see all Balvenies had on the mission, click HERE. Apples and honey, cinnamon, pie spices. Bubble gum, warm honey, vanilla ice cream. Cashews, chestnuts, melba toast, cloves, lemon zest, light and heavy at the same time. More vanilla ice cream, cinnamon, lemon meringue. Eager to have more. Very Balvenie honeyed tones with slightly oak-amplified vanillins. Malty core. Creamy finish. Perfectly balanced or perfectly plain, depending on perspective and/or mood. Clean and tidy whisky from the creative mind of malt master legend, David Stewart.